Picture from my old review! And we're back with the second Green Flash brew to make an appearance on Feature Beer Friday! 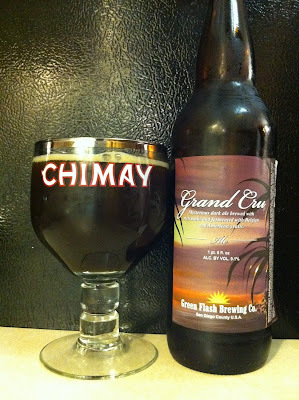 We reviewed the West Coast IPA not too long ago to generally high marks, and this time it's the Grand Cru, their take on a Belgian Dark Strong Ale... basically the same style as a Belgian Quad. I've actually reviewed this one once before, an earlier version well over 2 years ago... it'll be interesting to see how my thoughts then compare to my thoughts this time around. Their take on the beer: "Our Belgian-style Dark Ale is inspired by traditional Abbey Ales to deliver the richest malt flavors. Dual-yeast fermentation and spicy hops provide increased complexity and depth of flavor to satiate your palate and keep your taste buds dancing." That sounds good to me! Belgian strong ales have long been some of my favorite beers, so I'm excited to try this one for sure. Appearance: Dark red bordering on brown with an off-white head. Aroma: Fruity, rich, a little spice to it. Dustin thought it smelled strong, and it clocks in at 9.1%, so he's not wrong at all. Taste: It has a really nice malt/fruit combination on the palate, but also some spicy hop notes. Mouthfeel: Good carbonation, a little bitter, nice body. Overall: I really enjoyed this one, a nice slightly hoppy take on a Belgian style. Very well done, I think I like it more now than I did two years ago.